Influencers: Back in 2012, LinkedIn reached out to 500 prominent people around the world, from CEOs like Jack Welch and Richard Branson, to authors like Deepak Chopra, Guy Kawasaki, and Tony Robbins, to popular entrepreneurs like Mark Cuban, to share their wisdom and experience and generate discussions in the business community. 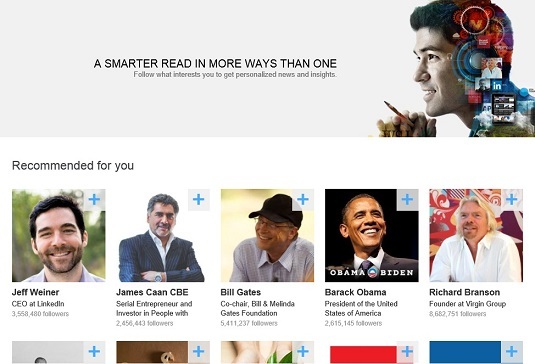 These thought leaders’ content was published on LinkedIn and given prominent placement. As LinkedIn noticed a high number of members viewing these Influencers posts, as well as Liking and Commenting on them, it decided to expand this program and add more Influencers to share their insights and experiences. 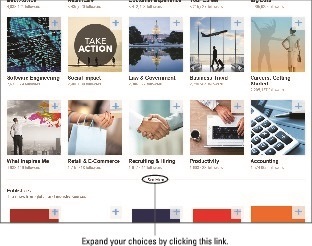 Channels: Articles that are generated can be categorized and collected by topic, whether it’s aspects of your career such as Leadership & Management or Marketing & Advertising; large industries such as Banking & Finance, Big Data, or Social Media; or specialized niches such as Green Business or Customer Experience. Publishers: When you’re looking to catalog and present lots of publishable information, it helps to go directly to the source. LinkedIn identifies publishers of all shapes and sizes, from traditional news outlets like The New York Times, The Wall Street Journal, and Time Magazine, to services like Reuters, Yahoo! News, and even niche audiences like National Geographic, Entrepreneur Media, Harvard Business Review, or the TED Talks series. When you initially set up your LinkedIn account you may have been asked to pick some of these elements to follow, and those show up in your Pulse feed. At any time, however, you can customize which of these sources you want to follow to add to the mix of articles you see on LinkedIn Pulse. When you go to your Profile page and scroll down the page, you will find a section called Following that shows which news items, companies, and schools you are following. The news items in particular influence what shows up in your LinkedIn Pulse feed. When you’re ready to change this list, click the Discover More link. See what you’re following on LinkedIn. You’ll be taken to the Discover More page, where you can pick which influencers, channels, or publishers you wish to follow on LinkedIn. The top of this page shows an assortment of these three elements called Recommended for You, based on the information in your LinkedIn profile and how you’ve been interacting with LinkedIn up until now. Below the Recommended for You section, you will find rows of “tiles,” or boxes of photos or logos, representing influencers, channels, and publishers you can follow. Discover more people or channels to follow. You can click any of these tiles to see their own influencer, channel, or publisher LinkedIn page and read the most recent set of articles by them, to help you figure out if this is a news source you wish to follow. 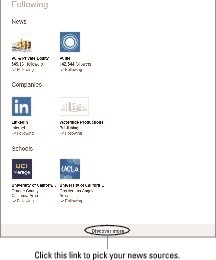 As you hover your mouse over any Influencer tile, you will see a link appear with their most recent post on LinkedIn. Clicking the + sign at the top right corner of the tile indicates to LinkedIn that you wish to Follow this source; once you click it, the sign changes to a green check mark. You can scroll through the screen and pick as many influencers, channels, or publishers as you wish to follow by simply clicking the + sign. If you change your mind, you can click the green check mark in the tile to change Follow to Unfollow and therefore “unsubscribe” from this source in your LinkedIn Pulse feed. As you decide which influencers, channels, or publishers to follow, keep in mind that if you simply click inside the tile and NOT the + or green check mark, you will be taken to their Pulse page and it will not affect your subscription to that source. When you want to expand your options in each of the sections, simply click the See More link in between the sections and more rows of tiles for that section will appear of sources you can follow, along with a new See More link below these new rows. You can click the See More link multiple times, as LinkedIn has hundreds of sources in each of these categories, providing you with a rich set of sources with which to customize your news. Click See More to expand your options.